Every child has their own individual sleeping and eating pattern and demands. Newborn babies in particular have no concept of daytime or nighttime for the first few weeks. The baby is simply not used to not getting food for a longer period of time. In the womb the baby was “fed” around the clock. Therefore, be prepared for many “duty calls” at night in the first few weeks. If you feed your baby infant formula, you can take turns with your partner to feed the baby. Of course, you can get the same benefit if you pump off breast milk in the evening and keep it in the fridge (well sealed at +4°C to +6°C for a maximum of 2 days). 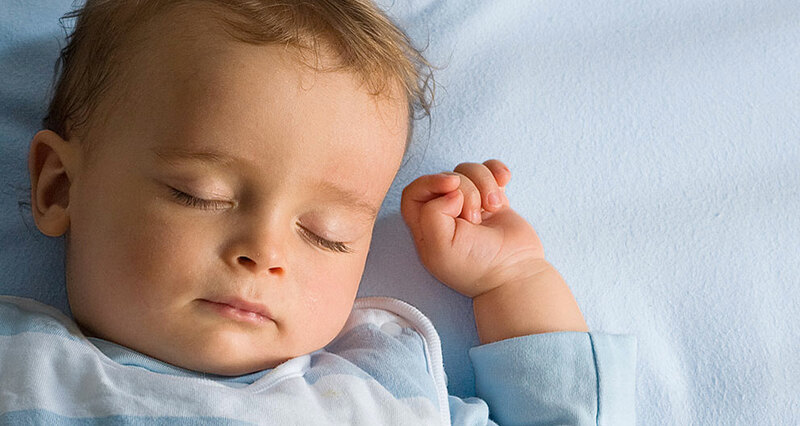 At the age of three months your baby will be able to handle longer periods of time between meals and will therefore sleep longer in the night instead of during the day. From the second 6 months, children no longer need food at night because at this age the hunger and fullness rhythm of a healthy child will entirely shift to daytime. As the last meal before bedtime, a milk pap will keep baby feeling full longer than breast milk or formula. HiPP Milk Paps are available as instant products. All you need is to stir it with water. For a feeling of fullness at night, not only is a nutritious evening meal important, but also sufficient food throughout the day. If you want your baby to sleep through the night, it is important to satisfy their nutritional requirements during daytime as well. Try to shift the energy content of the night meal to daytime. Offer a meal for lunch that contains vegetables and meat or fish. Simply replacing a milk meal with only a jar of vegetables will not be enough. At the beginning of the weaning food age and as long as your baby cannot finish an entire portion, you can still feed milk afterwards until your baby is completely full. Experience shows that the amount of milk will gradually go down, until the milk meal is completely replaced by a pap. Nighttime meals can turn into a mere habit which the baby becomes reluctant to give up. If your baby keeps waking up at night, we recommend trying tea without added sugar, or boiled water – but do not offer any food. Nighttime meals prevent sleeping through the night and can also damage baby’s first little teeth because it is unlikely they will be cleaned afterwards. Breaking this habit will, of course, take time and patience, but with gentle consistency you will achieve this goal. for the brain and nerve cells.